Chloe was born on May 11, 2004, in Florida. When she turned out too small to breed, she was given away. She bounced around through 3 homes in one extended family as people had time for her, and eventually wound up with an elderly grandmother. When Chloe was 9, and the grandmother could no longer care for her due to medical issues, the woman’s granddaughter (a friend of a friend of Chloe’s current owner) worked to find Chloe a home. It just so happened that her soon-to-be new human was looking for a dog just like her! 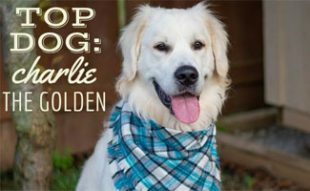 Shortly after going to live with her new human, they started an Instagram account to keep Chloe’s old family current on her new life in New York City. She was so photogenic and eager to pose that they started having some fun with the captions and photos and soon enough Chloe’s followers were climbing by the thousands. At 12 years old, Chloe and her human are doing great work to spread the word about senior dog adoptions and Chihuahua rescue. Read on to learn more about Chloe’s story. When my previous human became too frail to care for me, her granddaughter posted a message on Facebook asking if anyone was looking to adopt me. I was 9 1/2 at the time, and it wasn’t the easiest job to find a home that would want a dog of my age. It so happened that my soon-to-be human was looking for a dog after her last dog passed away and she loves adopting older dogs. Social media has always been the backbone of my fame since I met my human on Facebook. 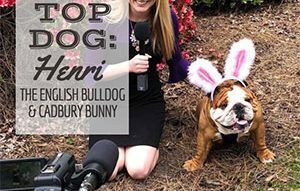 Once I was adopted, my human wanted to keep my previous family up to date on my new life so she thought I should have my own Instagram and a star was born! She caught on quickly to my love of the camera and fame – she points the camera at me and I give her magic. 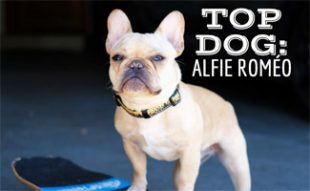 Watch this short video to see Chloe and her human strutting their stuff at the Webby Awards. What’s been your favorite celebrity moment? I really am so blessed! My human was super stoked about Dave Grohl. 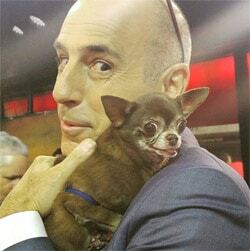 For me, snuggling with Matt Lauer was pretty amazing – he’s an excellent cuddler, as you can see. Have you met any of the Kardashians yet? I would love to meet the Kardashians, but they don’t seem to acknowledge that I’m their illegitimate relative. I was at the same event as Kim once, but she was gone before we ever saw her… I think they know my fame will eclipse theirs. We love your shop. Who does the beautiful illustrations? The illustrations are all done by my amazingly talented friend Elizabeth Caparaz. She is the only human I’ve met who can truly capture the essence of my beauty so perfectly. The graphic design items (stickers, calendars, etc. 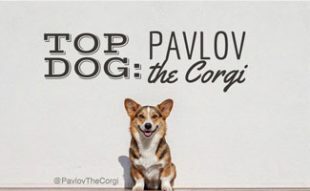 ), are all done by my human, who is a graphic designer. (See Etsy shop here). I’m nearing 13 in May, so I’m not gonna lie… I love a nap! I also love being chased around the ottoman in my living room for exercise. And in my spare time, I love to kiss humans as much as possible. Ella Bean is definitely my bestie. We became friends through our accounts and then our humans became friends in real life and now we all hang as much as we can, given our busy schedules. Plus we do lots of photo shoots together, like this one we just did for Moda Operandi. It is so fun to work with your friends! What’s your advice for other adopted dogs, especially senior ones? You’re never too old to fulfill your destiny! Whether it’s to become a star like me or anything else, we have plenty to contribute to the world! 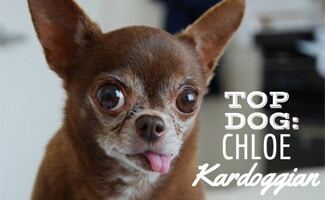 Thanks Chloe Kardoggian for taking the time to chat with us (and we hope you can meet Kim one day!). Learn more about Chloe and her latest press, whereabouts and more on her website. What would you ask Chloe if you met her IRL? This is a genuine thing happening? Celebrity dogs? Okay… lol. Chloe you are hilarious and adorable!